Little Avis Cardella devoured her mom's fashion magazines and learned to aspire to the images of a glamorous existence. Grown up, her relationship with clothing and shopping grows into an obsession. The author finds that she shops to define herself. But paradoxically she loses herself to what becomes a dangerous addiction. As she forgoes food for fashion, credit card debt grows like the ever-increasing pile of unworn shoes and clothing in the back of her closet. Life presents some hard lessons about money, men and the price of trying to keep up appearances. 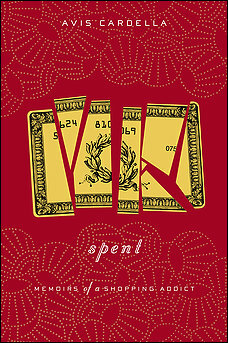 Spent is a timely, deeply personal and shockingly dramatic exploration of the cultural need to spend, and of what happens when someone is consumed by the desire to consume. Cardella writes about photography, fashion, and culture, and her work appeared in British Vogue, American Photo, and Surface, among other publications.